Description: The instrument is located in a historical village church in East Germany near Dresden, based on a church of the 13th century, which was reconstructed and extended during the following centuries, last in 1742. The church acoustics is dry and clear because of the large amount of wooden installations. The organ was built in 1729-31 by Gottfried Silbermann of Frauenstein/Sachsen, Germany. Gottfried Silbermann organ types can be divided into different architecture classes. This instrument represents a typical Silbermann middle-sized church organ and was one of the favourite instruments of Helmut Walcha and Herbert Collum/Kreuzkirche of Dresden. Typical Gottfried Silbermann organ features are strong and sharp aliquote stops, such as the 1 1/2', 2' and 3', rich and warm 8' Principal stops and bright superoctave stops, such as the 4', 2' and 1'. There are very characteristic basic stops such as the Rohrflöte 8' and Quintadena 8'. The resulting sound is bright, clear and sonorous. The organist doesn't need many stops to achieve a rich plenum registration. The organ is tuned to the so-called historical "Chorton" (a1=465 Hz). Nearly all pipes are original, especially the front pipes (Principal 8') , whereas most historical organs lost them during world war I, because of increasing needs for weapon metals. Nevertheless, the instrument had to bear several modifications in 1852 (equal tuning (thereby shortening the pipes! ), voicing modifications due to changing sound preferences, installation of a pedal coupler) and in late romantic period 1909, extension by a Salicional 8' with pneumatic tracking (!). In 1953, the wind pressure was strongly reduced from 94 mm to 70 mm and severe voicing changes were made, resulting in an extremely instable wind and totally altered weak sound characteristic with noticeable wind sag (listen to a small sound example of a Herbert Collums recording from 1965). 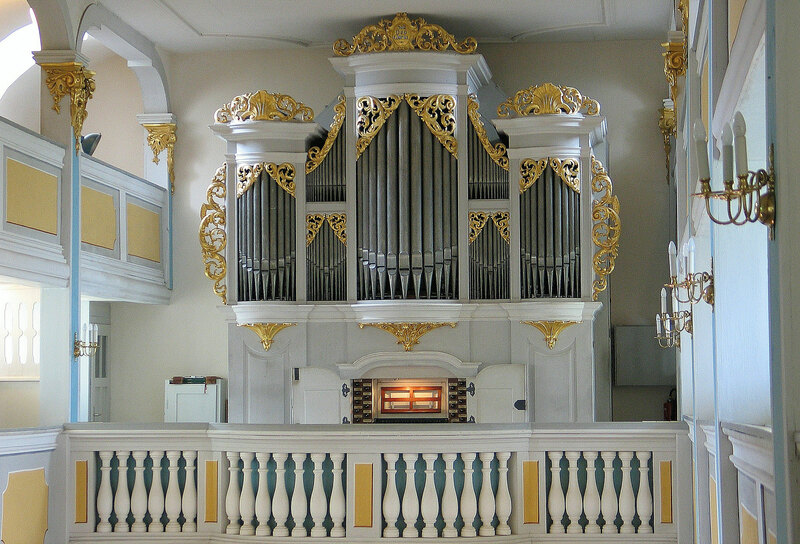 In 1997, Kristian Wegscheider, organ workshop of Dresden, was entrusted with the historical reconstruction and renovation of the original wind system and pipe voicing. The wind pressure was again set to 94 mm. Because of the loss of original tuning, it was changed to a historical Silbermann like tuning system, which specially enables the accompanying of baroque chamber music, resulting in very clear basic keys. The instrument has two manuals and a pedal with missing C#, mechanical tracker action, a manual shift coupler, a pedal coupler since 1852 (fixed coupling to the Hauptwerk before) and is fully playable and in excellent shape. The church room has a medium-dry acoustics with about 2 seconds of reverberation. The organ was first recorded and processed with 44.1 kHz, 16 bit, multi-channels in May 2003 originally for Hauptwerk V1 and reprocessed and redesigned for HW2 in 2006. A completely new recording took place in May 2010 with 48 kHz, 24 bit, multi-channel for Hauptwerk 3, using the multi-release technique introduced by OrganArt (available 2011/12). The stops were recorded with multiple release levels for short, medium and long key attacks for optimal acoustical mapping. All ranks were additionally recorded with the original tremulant sound. An upgrade for all customers will be provided.